Why Choose a Pergola Awning Over a Standard awning? Here in the UK we are always getting caught out by the unpredictable weather – one minute it’s sunny, the next minute it rains, and then the wind picks up for good measure! This can wreak havoc on our outdoor activities and means spending time in the garden can be infrequent and disruptive. Most traditional awnings will have an upper wind limit after which they need to be put away. The Weinor Pergola Awning, however, can withstand winds of up to force 6 (Beaufort Scale). This means that even if the sea breeze kicks in or the thermals build during the day, you can continue to use your awning all day long. If you are unlucky enough to get caught in a rain shower, the Weinor Pergola will keep you nice and dry. The adjustable telescopic posts can be lowered to allow water to drain off effectively and the super water repellent fabric will ensure the water runs away quickly. If you want to cover a very large outdoor area, a Weinor Pergola Awning is a great choice. The outer legs provide more support than a free hanging traditional awning, giving you the option to cover an area of up to 30 m². So, no matter what size of patio you have, a Weinor Pergola Awning will create a large area of shade and protection for all of the family to enjoy. 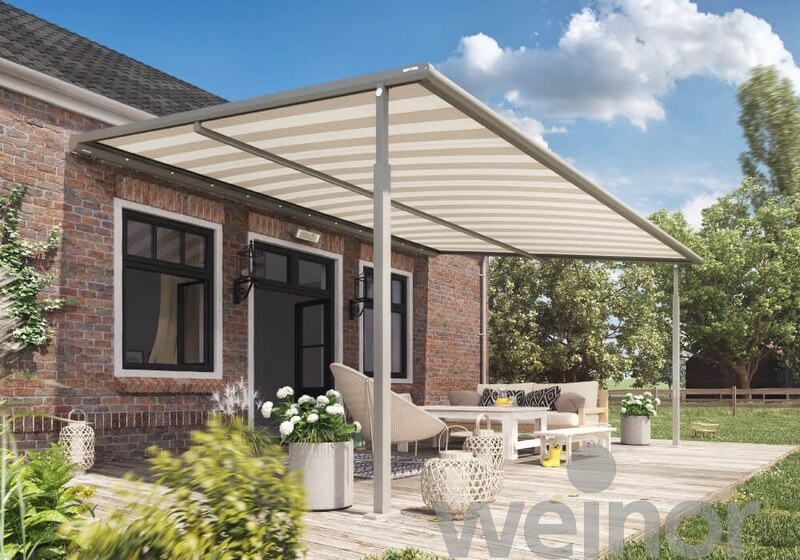 The Weinor Pergola Awning also provides the same great benefits as those of a traditional Awning including fantastic protection from the sun, a defined outdoor living space, an expansion of your indoor living space, shade for your home, reduction in window glare and privacy. Take a look at our blogs 5 Benefits of Retractable Awnings and 7 Reasons to Fit an Electric Awning to Your Home to find out more about the great benefits that Awnings can offer. If you think a Weinor Pergola Awning could be the right style of awning for your garden or patio, please get in touch with our sales team to find out more and to arrange a no obligation quote and free design consultation with the Awningsouth team.